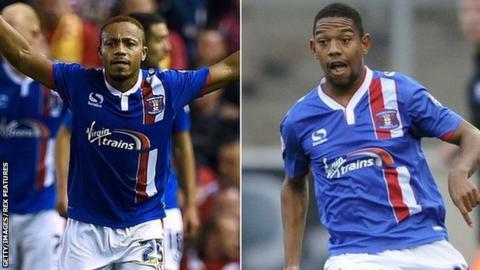 Striker Derek Asamoah and midfielder Angelo Balanta have agreed new contracts to stay at Carlisle United until the end of the season. Both players were out of contract this month having signed short-term deals at Brunton Park last summer. Ghanaian-born Asamoah, 34, has scored seven goals in 24 appearances this season, having previously played for Hamilton, Chester and French club Nice. Balanta, 25, has played 10 times since leaving Bristol Rovers in May. The Colombian-born midfielder has scored once for Carlisle, the equaliser in their 2-1 win over Dagenham and Redbridge in September. "I don't mind saying I'm the biggest fan of what Angelo can bring to the squad and the team," manager Keith Curle told the club website. "When he's firing on all cylinders and playing with confidence he's a great player to watch, and he's shown us that when he's been out there for us." On Asamoah Curle said: "He can change games with the drop of a hat and I know from talking to supporters that he has become very popular. "That comes as no surprise because he has pace and a little bit of flair, as well as the ability to score and create goals."